608 pages | 327 B/W Illus. Updated to reflect the current usage of Eurocode 7, along with relevant parts of the British Standards, Pile Design and Construction Practice, Sixth Edition maintains the empirical correlations of the original—combining practical know how with scientific knowledge —and emphasizing relevant principles and applications of soil mechanics and design. Contractors, geotechnical engineers and engineering geologists responsible for designing and constructing piled foundations can find the most current types of pile, piling equipment, and relevant methods in this latest work. The book summarizes recent changes, including new codified design procedures addressing design parameters and partial safety factors. It also presents several examples, many based on actual problems. Pile Design and Construction Practice, Sixth Edition serves as a comprehensive guide for practicing geotechnical engineers and engineering geologists. This text also works as a resource for piling contractors and graduate students studying geotechnical engineering. "If you work in the ground engineering sector then this is a must for your bookshelf. 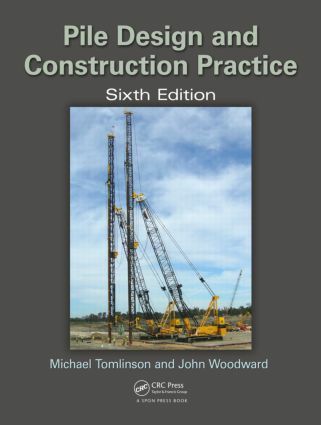 … Now in its sixth edition, this book adheres (excuse the pun) to the guiding principles of the first… New material extends to the consideration of new codified design procedures such as Eurocodes, the use and development of larger more powerful pile installation equipment and new methods of analysis based on current innovation and research." "This is the standard of care, the ultimate, practical arbitrator." "The book gives a comprehensive overview of the piling techniques in common use, their advantages and disadvantages. This information gives a sound basis for the selection of a given technique. Design of piles to Eurocode 7 is well described and all the general pile installation methods covered." The late Michael Tomlinson was a pre-eminent structural, civil and geotechnical engineer in a career spanning over 60 years of contracting, designing and independent consultancy. He served on several British Standards committees and was the first recipient of the Skempton Gold Medal awarded by the British Geotechnical Society. John Woodward has extensive experience of piling and ground engineering projects in the UK and overseas, recently as a consultant investigating piling and stability failures and as an adjudicator resolving contractual and technical disputes. He is also author of An Introduction to Geotechnical Processes (Taylor and Francis, 2005).